The European Commission says Croatia is on track to become the 28th member of the European Union, despite a wave of mafia-style violence. A draft commission report seen by the BBC gives - for the first time - a timetable for concluding accession talks with Croatia by the end of 2009. 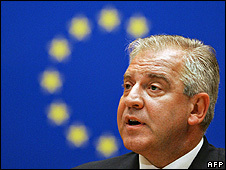 Provided it meets all the EU conditions, Croatia could join in 2011. The report, set to be adopted next Wednesday, also calls on Turkey to resume political reforms. After a wave of mafia-style violence, including the killing of a prominent journalist, Croatia has to show it is cracking down on organised crime and corruption. Meanwhile, France and Germany say any talk of dates is an empty promise, unless the EU finds a way to revive the Lisbon reform treaty, meant to prepare the bloc for new members. The draft report calls on Turkey to give a new impetus to reforms to strengthen democracy and human rights after a political crisis earlier this year. But in the wake of the war in Georgia, it also highlights Turkey's increased significance for the EU's energy and regional security. For the third year in a row, Macedonia fails to secure a date to start membership talks, after parliamentary elections which the report describes as marred by violent incidents and serious irregularities. But the draft says Serbia could be granted the coveted EU candidate status next year, if it presses ahead with reforms and fully co-operates with the UN war crimes tribunal.